This is the 10th Anniversary Edition of one of my favourite books. I've read this story several times--one time I even read it to my daughter--and it's just as awesome every single time. It's one of those stories that you can read over and over again and never get sick of it. Coraline and her parents have just moved into a new and very strange place. Her parents don't seem to have any time for her, because they're busy doing their own thing, but at least she can go exploring. Exploring so much that she finds a locked door in the drawing room. One that opens up to a brick wall. When it somehow opens up she gets caught up in a world opposite to her own, where everything is familiar but a little different. And her other parents have button eyes. 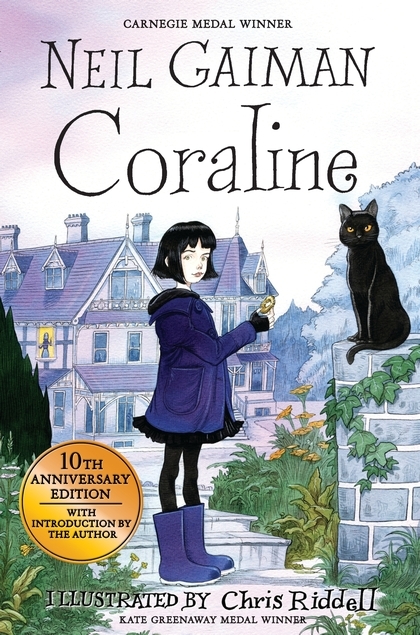 Coraline is a beautiful story for audiences of all ages. It's got a little bit of everything, and Coraline is such an intriguing character. I absolutely LOVE this book! Another thing I loved about this edition was the new illustrations, and Neil Gaiman's introduction just rounds off a lovely reading experience.